My Dad’s writing career produced many published works, including a three part history of Glenrothes, a brilliant – and still useful – textbook on local government law in Scotland, and a contribution to the Stair memorial Encyclopedia on Scots Law, the magisterial tome that all Scots lawyers start their research at. His final book was a very personal one. Following Mum’s passing in 2011, he was determined to use his extensive family history research tell the story of her father, Charles Leslie Anderson, my grandfather, who had fought through the First World War. Unfortunately Dad died before the book could be published, but my sister had worked with a friendly book designer and a publisher to get a proof copy organised for Dad to see while he was in hospital, and 200 copies have now been printed. Although my Grandpa Anderson ended his days in Glenrothes, where I knew him as a kindly, wise old man, much loved by my brother, sister and me, he spent most of his life in Huntly, Aberdeenshire (for the uninitiated, ‘loon’ is Doric for ‘lad’). Dad was mindful, as all writers are, of a potential market, and had always intended that the book come out this year on the centenary of the outbreak of the so-called Great War. Book launches are planned for Huntly and Glenrothes – more details soon. Keith Ferguson’s final book is a personal history of the First World War seen through the eyes of his father-in-law, Charles Leslie Anderson. An ordinary soldier who fought right through all four years of the War, ‘the kindest, most modest and uncomplaining of men,’ he endured all the horrors of trench warfare, including being wounded and gassed. Ferguson intersperses the account of the battles with personal notes from Charles and others. You learn how to de-louse a kilt, and why he (and many others) always had a soft spot for the ordinary German soldiers. The book also tells us the personal story of a man who, from the most deprived of rural backgrounds, rose to be a respected bailie of the burgh, a shopkeeper, father and grandfather who carried German bullets in his legs for the rest of his life but rarely – and only then modestly – spoke of his part in World War One. 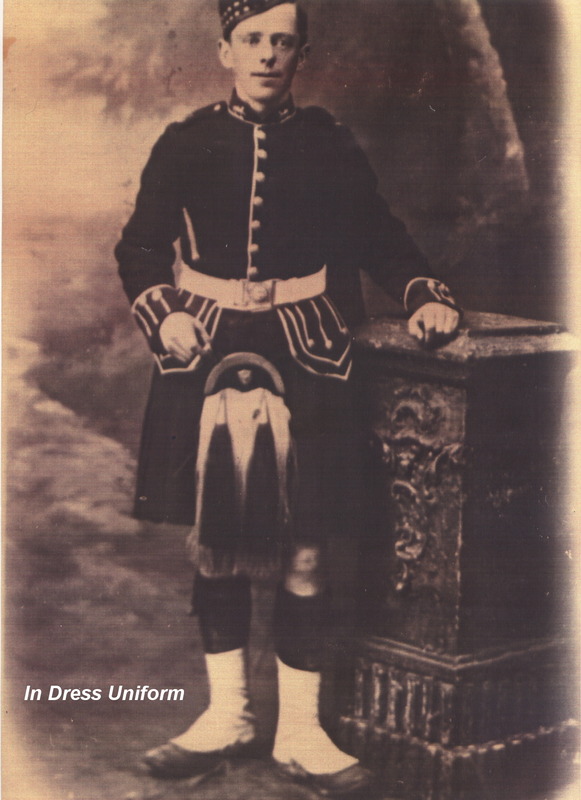 Charles Leslie Anderson in full dress uniform at Bedford barracks, late 1914, just before embarking for France.